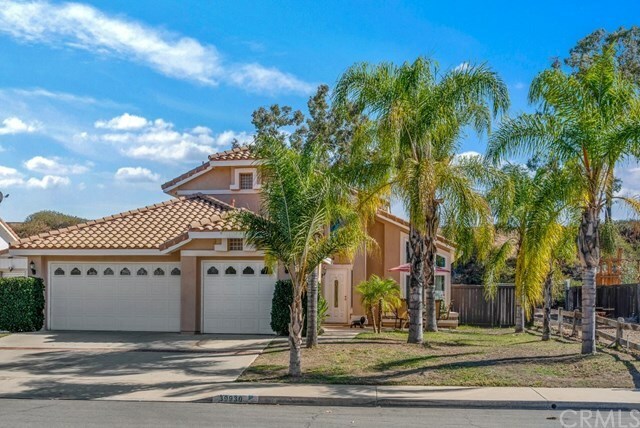 Wonderful home located in a highly desired Central Murrieta neighborhood on a quiet cul de sac street with NO HOA and LOW taxes. Easy freeway access, shopping, restaurants and entertainment are just minutes away in every direction from this convenient location, as well parks, hospitals, health services and all the great schools that surround the area. Backing to a green belt, this freshly painted 4 bedroom, 3 full bath home comes complete with new windows and sliders, a fireplace in the family room, vaulted ceiling in the living room, a three car garage, A/C, indoor laundry, Fios enabled internet and Solar Power. Home layout includes a bedroom and full bath downstairs, three bedrooms upstairs featuring a Jack and Jill bathroom and a large master bathroom with a walk-in closet. There is a large deck off the master bedroom where you can sit and enjoy the evening breezes. The kitchen has granite countertops and stainless-steel appliances. This home sits on a large Â¼ acre lot with plenty of room for additional parking behind the gate and comes with a shed for extra storage. With no rear neighbors you can enjoy the privacy of the back yard for gatherings and relaxation. Must see to appreciate!